Posted September 24th, 2018 by Heidi Swander & filed under News. It’s beginning to look a lot like . . . a humorous-yet-inspiring Christmas with Tribute Quartet! I (Heidi) have been looking forward to this concert all year because these guys are fun and all heart. Approachable, yet serious when it comes to the gospel! We’re going to have an AMAZING evening celebrating the birth of our Savior and you aren’t going to want to miss it! 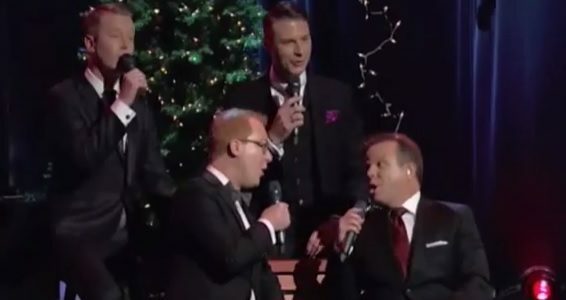 Since 2006, nationally-known recording artist Tribute Quartet has become one of the country’s most dynamic and beloved male quartets in all of gospel music. Gary Casto, Josh Singletary, Riley Harrison Clark, and Anthony Davis have proven to possess the winning combination of musical talent and warm and engaging personalities. In an ever-changing musical climate, Tribute has remained steadfast in their goal to make great music that is both timely and relevant to the current musical scene and their loyal fan base while never wavering from their God-called mission to share Jesus with everyone with whom they come in contact. With a career that has already spanned the U.S., as well as several foreign countries, Tribute’s popularity continues to grow. The men of this quartet attribute that first and foremost to the favor of God on their lives and ministry, as well as their many fans and friends who continue to help grow this ministry one friend at a time. GracePoint Church is welcoming Music for the Master and Tribute Quartet for this special Christmas concert and we’re excited to be there! This auditorium is intimate and inviting and they’ve promised to have their Christmas decorations up! Seating is limited for this venue, so best advice: Get your tickets TODAY! No dallying! Tickets are available online (choose your own seat!) or call the ticket office at 651-638-6333. This hotel has a number of amenities right in the same building and your price includes a deluxe continental breakfast. Print and share our concert flyer! We’ve seen these guys in action (if you were at our last Tribute concert), but never for Christmas. I guarantee you this is gonna be a BLAST! here’s just a sample of their Christmas music that I think you’ll thoroughly enjoy!